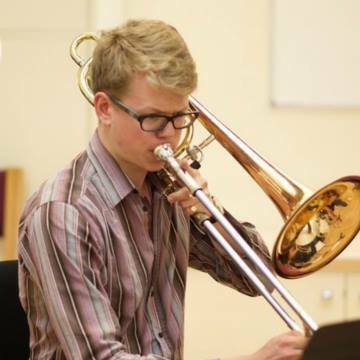 Barnaby Medland is a busy London based bass trombonist who is at home playing in a wide range of different ensembles, from symphony orchestras, to big bands and chamber groups. He has played with a number of orchestras and big bands around London including the London Concert Orchestra, the Orpheus Sinfonia, the Mozart Symphony Orchestra and the Andrew Linham Jazz Orchestra. He has also toured all over Europe. Barnaby has played under the baton of such eminent conductors as Bernard Haitink, Sir Colin Davis and Sir Simon Rattle and played in most of the country’s major concert halls. In 2011, Barnaby accepted a scholarship to study for a Bachelors of Music at the Guildhall School of Music and Drama. At Guildhall he studied with David Stewart, Eric Crees, Simon Wills, John Kenny, and Chris Houlding, a finer selection of professors is hard to imagine. Barnaby graduated with his BMus (Hons) in July 2015. Barnaby is a founding member of the brass dectet Milton Brass, who won the 2014 June Emerson Launchpad prize. Now Barnaby is studying towards his Masters at the Royal Academy of Music, to which he has generously been awarded an entrance scholarship. When not playing the trombone Barney is a poetry lover, keen amateur historian, and hostelry enthusiast.